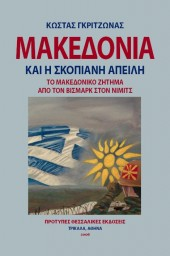 The name “Macedonia”, from which derived: Macedon(ios) = Macedonian, Macedon(Greek Μακεδονία > Μακεδον(ίος) – Μακεδών), such as: Magnis, Maketis and other, etymologically derive from the Dorian root «mak-» from which derive the following: makos or in the Ionian dialect “mikos” (= length, long ) and magnus (= big = long, such as macaroni, spaghetti and other), as well as the compound words: Macedonia, makednos … In Odyssey (G’ 106) it is reported as “οία τε φύλλα μακεδνής αιγείρειο”, where the word “μακεδνης = makednis” reveals the adjective “makednos, that is translated into ‘evmikei’, that is to say with ‘makos’ or (in the Ionian dialect) «mikos”, meaning ‘length’ and consequently “Makednos” meaning ‘maketis (evmikeis= tall’, referring to men and Macedonians = ‘evmikeis = tall men, and thus “Macedonia” = the long country. However, different is the word: “makkos” with two ‘kk’ or contemporarily “makos”. The word “edanos” Iliad (N, 172) with the tone in the suffix it means pleasant, “ednon” = sweet, savory, odoriferous and other, from “edos > idy (ηδύς) ” and “idos, idomai” = pleased, satisfied. With this etymology “makednos” means maketis= (long, tall) and edanos (sweet, likeable, beautiful) meaning man. The word “ed(a)nos,” with the tone in the first syllable means either the nation (derivative: “seat, capital”), Dorida, cradle of the Dorians or the gift – the gifts (from ‘edna’, ‘ednaomai’-‘omai’, ‘ednoo’-‘o’ = gifts, I give away), hence “ednoi” – mak-ednoi =Dorians – it is reminded that the Macedonians are of Dorian origin. With this etymology “makednos” = maketis = (long, tall). Dorian (that is, “Dorianstrichaikes) and Macedonia = the great Dorida.